Click above and join the Rock-it Listeners Club - It's FREE & you get notified when New shows are on - And our playlists - along with Cool Oldies news and Links as well. Just Click the banner above and follow the Instructions! As of 22 October, 2011 we currently have 40,419 members in our listeners club. Click here to Tune into Rock-it Radio Right now! Click here to SAVE The Rockabilly Hall of Fame... They Need your help!!! Note: If you know of any other Rockabilly Resources or Bands websites please e mail us and let us know. And we will put it on here. Click here to e mail us at Rock-it Radio and let us know!. We would also appreciate a reciprocal link as well - Here is a webpage to place the Rock-it Radio Reciprocal Link webpage. Hear the Cool Tunes; The Vintage Ads And Awesome DJ's when AM Radio ruled the airwaves. Bennie Dingo's - Rock-it Radio Myspace webpage With several more links to Rockabilly and Doo Wop Groups and Bands, Clubs, Venues Etc. Bakersfield Rockabilly dedicated to the history of Rockabilly in Bakersfield, Calif.
Bomis.com - Rockabilly Directory 100+ Rockabilly Links on this site from around the world. Hillbilly central Home of the Hillbilly Mailing List. IUMA Rockabilly Music Page IUMA Rockabilly Site Lists Top 10 Downloads of Rockabilly MP3's with there available downloads. Kylie's Swingin page of fun! Rockabilly / Swing page. Mybabyjo.com Great Rockabilly and Retro styles for gals and Guys. This site is also a sponsor of Rock-it Radio! Rockabilly Dating Go and meet the Rockabilly Cat or Kitten of your dreams! Rockabilly Fever New for 2008 -- Great Rockabilly Social Networking site with lots of potential! Rockabilly Hall of Fame out of Jackson, Tennessee. Home of Rockabilly Fest 2002 in August! Rockabilly Rebels Various rockabilly links. Rockabilly Rules St. Petersburg Russia Rockabilly Site. Rockabilly Uprising Cleveland Ohio Based Rockabilly Site with local and National Rockabilly News and Venues. Rock N Roll Pagina Rock & Roll and Rockabilly Site out of The Netherlands with several cool links. Rocky Mountain Rockabilly If you love Rockabilly and you live in the Rockies.. this is the site! Rockin' Rudy's Den Great Rockabilly page from Detroit. Jonny 'The Velvet Elvis' Barber & The Rhythm Razors Featured on Rock-it Radio show #2156- Rock-a-billy Records Recording artist. Black Raven Great Sounding German Rockabilly band that has been out there since 1993. Brandi and the Bad Cats Rockabilly Band out of Queensland Australia - Soon to be featured on Rock-it Radio! Cadillac Attack Rockabilly band out of Pensacola, Florida with there brand of Hot Rod Rockabilly! Ray Campi Rockabilly Icon from California -- this is his official website where his music can be purchased. Rip Carson One of the most energetic Rockabilly cats out there today! from San Diego, Calif.
Johnny Cash - Rock-it Radio Tribute Page Rock-it Radio Tribute Page to the Man in Black -- Johnny Cash! Cattie Ness & The Reckoning Bennie Dingo's Favourite RAB Band today! Out of Fresno, Calif.
Cave Catt Sammy Hailing from San Antonio, Texas these guys know Rockabilly! The Chop Tops Rockabilly Group out of Fresno, Calif.
Cigar Store Indians another one of the first RAB bands that Rock-it Radio played that's out there today. Roy Cost Brand new Rockabilly Release "Rockabilly Baby" In EUrope plus an online Rockabilly DJ show! Crazy Legs Rockinest Rockabilly Band out of Brazil! Jem Crossland & The Hypertonics Rockabilly Band out there today - That is rockin' the heck out of North Carolina and has a New CD out! Pat Cupp Official Website of this Rockabilly Great! Bennie Dingo Bennie Dingo's website in the Rockabilly Hall of Fame site. The Fire Bird Trio Victoria, Australia Rockabilly band - was featured on Rock-it Radio show #1970. Frankie Ford The New Orleans Dynamo from Sea Cruise Fame! Gas Money Retro Rockin' band out of Philly PA.
Goin' Ape Hot Rockabilly band out today from Norway. Charlie Gracie Rockabilly performer of the past and today! Hack & The 57's Rockabilly from the Southwest!!! Kingman Arizona! The Hammers New Jersey's premiere 'Bluesabilly' band featured in Rock-it Radio show #1970. Dale Hawkins Official Website of Dale Hawkins - Louisiana 50's Rockabilly Legend. Highway 13 Rockabilly Band from Pittsburg, Pa. Hot Rocks French Rockabilly band featured in Rock-it Radio show #1970. James Intveld We first met this Rockin' cat in '98 in Irvine, Calif. And he is still rockin' the heck out of the Southland! The Jets Rockabilly Band out of The UK that has been Rockin' Them for 30 years! Johnny & The Midnight Trio South England Rockabilly Band out there today featured on Rock-it Radio show #1970. Bob 'Git it' Kelly 50's Rockabilly Legend that is still out there today with a new CD Release. Featured in Rock-it Radio show #1970. Kings of Nuthin Great new upcoming Rockabilly band from Allston, Mass. Lee's Revenge Rockabilly Band out of Austria. Lustre Kings Roots Style Rockabilly from the East Coast. Carl Mann Former SUN Record recording artist -- RAB Hall of Fame performer - Latest CD featured on Rock-it Radio show #1970. The Megatones Rockabilly Group out of Spain. Mystery Gang Trio Great Sounding Rockabilly Band out of Budapest, Hungary. 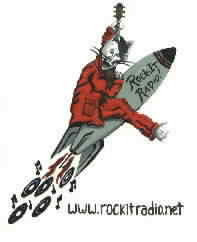 And now with there own Rockabilly show "Hepcat Jubilee" right here at Rock-it Radio. Oh Johnny Girls Rockabilly Band out of Norman, Oklahoma -featured on Rock-it Radio show #1970. Roy Orbison official website of this former SUN artist and Rockabilly and Rock and Roll legend. Tracy Pendarvis SUN Record Singer from 1959 that had great music but just arrived a little late to SUN. Sam Phillips Biography Page Rockabilly's Hall of Fame biography on the founder and creator of SUN Records. PV & The Heartbeats Rockabilly band on Rarity Records from the Netherlands! The Ridgerunners Rockabilly - Hillbilly Style out there today from Salt Lake City - Catch them at Viva Las Vegas 2004! Jack Scott RAB artists with hits like "The Way I walk" & "What in the world's come over you"
Roman Self Music is featured in Rock-it Radio show #730 -- New CD out -- Tribute to his Father Mr. Frantic -- Ronnie Self. 7 Shot Screamers Rockabilly band out of St. Louis, Mo. Skip Rats/a> UK Rockabilly at it's best! The Sprague Brothers Rockabilly Brother Duo featured on Rock-it Radio show #1970. Tiger Army Probably the Hottest Psychobilly Band out there today. Tip Top Trio Myspace website for this Great Retro Rockabilly band from San Francisco and Sacramento Area. Pep Torres Rockabillidad out of Hollywood, calif. Turbo 350 Memphis Tennessee Rockabilly Band out there today - soon to be aired on Rock-it Radio! Ultra Kings Fantastic Rockabilly Band out of Pennsylvania - Featured in Rock-it Radio show #750. If you know of any other Rockabilly Singers or Band Websites not listed here please let us know about it by e mailing us here at Rock-it Radio. Also, any bands wishing Airplay as well on Rock-it Radio and her affiliates should e mail below on information where to send there press kits etc. JCR Records Rockabilly Record Label out of Switzerland - features RAB bands like The Reptiles. Atomic Magazine Great Retro Magazine! Custom Built Magazine Rockabilly and more from Finland. Phew! Magazine Lots of cool rock'n'roll info. Rockabilly Magazine U.S. Modern Day Rockabilly Magazine - with CD Reviews, stories et al! Shakin' Fever Rockabilly e-Zine, based in Belgium. 'Catch that Rockabilly Fever' New Book out by former Rock-it Radio Rockabilly DJ - Sheree Homer! Come Join the Yahoo Rock-it Radio Rockabilly Club! Yahoo Rockabilly Clubs Listing of all Rockabilly Clubs on Yahoo. Blue Suede Cats and Dungaree Dolls Online Rockabilly Group Hosted on Yahoo! Greaser Garage Another Rockabilly Group on Yahoo! Greasy 50s Another Rockabilly Group on Yahoo! Greasers and Rockabillies United Another Rockabilly Group on Yahoo! RAB World Another Rockabilly Group on Yahoo! Rockabilly Corner Another Rockabilly Site on Yahoo! Wild Rockin' Rhythms Another Rockabilly Site on Yahoo! If you know of any other Rockabilly clubs please let us know about it by e mailing us here at Rock-it Radio. Atomic Magazines Retro Radio List Geographic locator of Retro Radio Stations in your area. Heebie Jeebies Show on Stadsradio - Netherlands Dutch Radio Show with some pretty great Rockers. Return to the Rock-it Radio homepage. Attention: Bands -- How do you get airplay on Rock-it Radio -- Click here. This rockabilly-ring site owned by KRKT-Rock-it Radio! . Note: All of our Vintage Radio Broadcasts are listed thru Ebay Stores. If you are not a member of Ebay it is easy to join and can open a whole new world for you in excellent items. Just click to the link below.